A bumper day of gull tagging. Last Thursday the sun was splitting the skies as we headed off on The Caledonian Isles at 7am for a day of tagging on the Pladda, a wee uninhabited island off the south coast of the Isle of Arran. Pladda is monitored by some of the members of the Clyde Ringing Group and Terry was there to meet us off the ferry and take us over on his trusted wee boat. Loaded up with traps we pottered over and got set up next to the old wheelhouse. A quick shufty through the nearest Lesser Black-backed colony showed us that many of the gulls were still on eggs. The traps were set and within 30 seconds we caught the first of our birds, a cracking male for tagging. This was followed by two birds too small to fit with tags. They were colour ringed before release. After that we caught a female, only our second to be tagged, a mega grumpy male, a docile male and finally the biggest male we have ever handled. In total we managed to deploy 5 tags and the pages for 0L1:C, 0L3:C, 0L4:C, 0L5:C and 0L6:C are now all live in the Team Gull section on our website. We packed up with the view to get the 1640 ferry back but this plan was almost foiled when Terry’s engine decided it didn’t want to start. Terry quickly took up the emergency oars and within half an hour we were back on Arran without him breaking a sweat. The boat was put away the ferry was caught and a plate of Calmac’s finest Mac N Cheese was devoured. 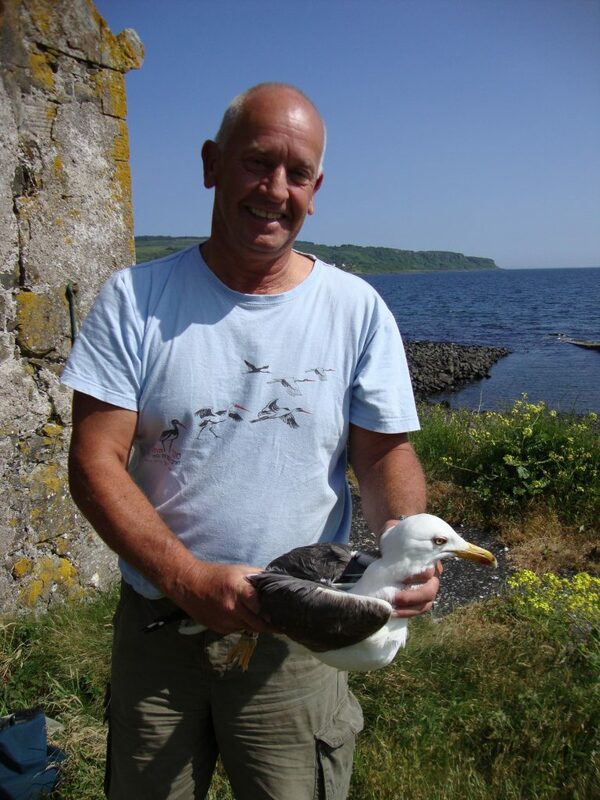 Our thanks go to Terry and the Clyde Ringing Group. Nine tags out and four more to go.